Over the next few days Steam will be rolling out some updates to the Steam Community. For the first day, they’re announcing new Game Hubs. 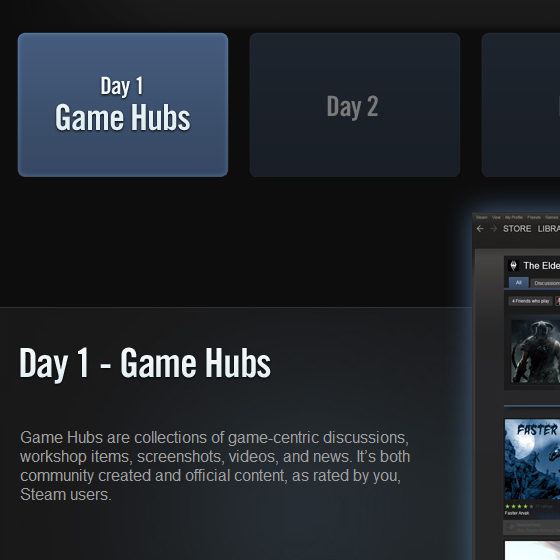 “Game Hubs are collections of game-centric discussions, workshop items, screenshots, videos, and news. It’s both community created and official content, as rated by you, Steam users,” it reads. From here you’ll be able to see Youtube videos uploaded by people who have linked their Steam and Youtube accounts, screenshots people have taken while in-game, a discussions tab (to save the time of digging through the Steam Forums), and you’ll be able to vote things up or down and the more popular content will stay at the top. Here’s the official page for the updates. Keep watching that page over the next 4 days to see what other cool things they’re going to be bringing to their store’s community and when they’ll be announcing a closed beta of the updates. Last month Joystiq showed a leak in the Android Steam app that listed various categories such as Education, Audio Production, Design & Illustration and more. Valve already sells a few non-game related items in the Steam Store such as Indie Game: The Movie, but nothing like Excel or Photoshop. I’ve got mixed reactions because I don’t always care to have all my eggs in one basket and I already use Ninite to install most of my “necessary” software like Foxit, Firefox, Adobe Flash, etc. I also hope this means that more software I need will be compatible with Linux due to all the steps Valve has taken recently to expand into the free OS, although this is just speculation for the time being. Always wait until the game you want is a “Daily Deal“. Daily Deals get huge price cuts and only last one day. The end date is well publicized and if the game you want never becomes a Daily Deal, it will be the same price on the last day of the Summer Sale as it was on the first day – and you wouldn’t have purchased it at a higher price than the Daily Deal. Create a wishlist, if you haven’t already. Check it each day. Don’t have a computer? Use your smartphone. There’s an app for that! Since there are so many bundles, you may want to grab some. Problem is, some may have games in them that you already own. If you do, you may not get an extra copy of the game. This may be a big turn-off for some of you. However, the games in the bundle will more likely than not go on sale individually anyways, so don’t worry too much. If it is around 1-3 games you already own out of 10 games, go for it. Much more than that and I would pass. There’s a Community’s Choice this year. It’s a poll on the right side of the store that allows you to cast your vote for the next potential deal. This poll refreshes every 8 hours. I understand if you don’t want to come back every 8 hours, but it’s worth voting if you’re at the store because unlike the Presidential Election every 4 years, your vote can actually count and make a difference! There are also “Flash Sales” which are randomly selected titles (could be tied in to the Community Choice vote, not sure about that this soon) that seem to last between 8 and 12 hours. If you’ve been holding out for a game to make the Daily Deals but hasn’t yet and see it in the Flash Deals – go ahead and grab it. Last but not least there are Badges. You can see your badge progress in a little section on the right hand side of your Steam community profile page. Clicking on that will show a series of tasks that you can complete to level up your Steam Summer Sale badge and earn a “Pillar of the Community” badge. There are bound to be rewards tied to these somehow, but I’m not sure how that works just yet.